Peeping Tom is a "window" cat. 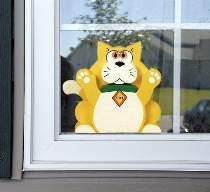 He sits on your window sill, paws pressed against the window pane watching and waiting for you to come home. Tom measures 9"H. Patterns drawn FULL SIZE.